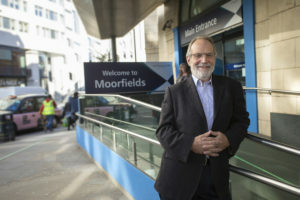 Moorfields Eye Hospital was founded in 1805, and today is the oldest ophthalmic hospital in Europe. This world-class hospital supports a staff of 2,300 people, and thousands of patients each year seeking specialized eye care. The smart, connected building management system included in the solution creates an efficient, user-friendly, and comprehensive experience for the facilities staff – making building data easily accessible from a single platform. The hospital was also able to integrate their older, but still valuable, assets into the new platform to create a unified system. The simplified data monitoring and collection has also eased regulatory compliance reporting for health and safety. The environment and power monitoring solution installed in the hospital’s operating theaters is a standout example of how EcoStruxure is making the hospital a safer place. Moorfields’ doctors worked with facilities staff to design an operating theater panel that provides surgeons with a clear view of relevant information regarding the building and electrical systems. From temperature, humidity, and air pressure to power availability, doctors can keep an eye on conditions and equipment and make informed decisions about the whether it is safe to proceed with a surgery. As part of the EcoStruxure for Healthcare IoT platform solution, Moorfields has adopted Real Time Location System (RTLS) technology, which has proved itself a valuable resource. Using RTLS tags, hospital staff can now quickly locate assets such as wheelchairs or medical equipment, to get them to the patients and doctors who need them as quickly as possible. In addition, this technology can allow for the quick location of key staff members, who may be needed immediately in various locations. Moorfields is also using this RTLS technology to improve the patient experience at the hospital. The solution can trace a patient’s journey during their time at the facility. Administrators can track wait times and visit lengths, and use this information to streamline and improve the patient experience. And, of course, EcoStruxure for Healthcare is saving Moorfields money. Thanks to the extensive monitoring and reporting that the platform provides, the facilities staff spends fewer hours performing maintenance tasks, resulting in reduced operating costs for the hospital. With EcoStruxure for Healthcare by their side, Moorfields is sure to continue and improve upon their outstanding service to their patients in the years to come. Want to learn more about how Europe’s oldest ophthalmic hospital is making EcoStruxure for Healthcare work for them? Watch the video here.